Home Loan Myths as the name suggests are the misconceptions about Home Loan. I tried to found out who all are responsible for home loan myths. My conclusion is that primarily three factors are responsible. The first one is a lack of knowledge of Bank/HFC (Housing Finance Company) employees. Secondly, the people around us who pass half baked information thus responsible for the viral effect of home loan myths. Till date, i have not come across a single person in my acquaintances who told me “I don’t know”. You can discuss anything and everything on this planet with people around you. They will share their opinion irrespective of the fact whether they know or not. Lastly, the lack of information on the web. To be very honest, it is in the interest of financial institutions not to share complete information with potential borrowers. More the information available, more questions the potential borrower will ask. More questions from potential borrowers mean the least probability to close the home loan deal :). Ignorance of a potential borrower is bliss for banks and HFC’s. Some of the home loan myths are already discussed by me under various posts in Home Loan section. My thought process is to bring everything under one roof. It will be convenient for readers to go through all the home loan myths in a single post. The objective of this post is to enable potential borrower in taking informed decisions while finalizing a home loan provider. In some cases, the approach of a borrower is that we will transfer home loan after few years. Trust me balance transfer is not that easy and comes at a cost. An informed decision-making at the first place makes life simpler and easier for a borrower. Let’s check out. 1. RBI Fix Interest Rate of Home Loan: In last one year, RBI has cut the REPO Rate by 1.25%. A REPO Rate is a rate at which central bank i.e. RBI lends money to the commercial banks in India in the event of a shortfall of funds. Most of the queries i received after RBI policy review is that “RBI has reduced Home Loan Interest Rate, but my bank/HFC is not obliging”. Let me clarify that RBI has no DIRECT ROLE in FIXING the Home Loan Interest Rate”. RBI only formulate the policy that increase or decrease the cost of funding for banks. It is one of the biggest Home Loan Myths. A policy change of RBI may or may not change the average cost of funds for banks. A bank may or may not borrow from RBI. The sales team of banks is responsible for this kind of Home Loan Myths as they pitch their product against HFC’s. The base rate of the bank is the average cost of funds. From April 01, 2016 the Marginal Cost of Funds based Lending Rate will be implemented. If your home loan interest rate will be linked to Marginal Cost of Funds based Lending Rate than interest rate will be more closely related to RBI’s policy. In short, a borrower can say that RBI is fixing my home loan interest rate :) though it will not be 100% true. 2. The title of the Property is Bank’s Responsibility: It is one of the most common home loan myths that approval of home loan means the title of the property is clear. I discussed it in detail in my post, Property Title Search. In layman terms, A home loan can be considered as a personal loan and property papers are just a collateral against the home loan. A collateral is required as the loan amount is huge. A buyer is solely responsible for the title of the property. Though efforts are being made by central govt through real estate bill to put the onus of title of the property on builders. This problem is more prevalent in states where JDA is signed between land owners and builder. Among all home loan myths, this should be taken more seriously by the borrower. 3. Bank DSA or Staff can influence the Home Loan Approval: I am very sorry to say but in many cases, the behaviour of bank staff dealing with a borrower is nothing less than BULLYING. They threaten the borrower that if they do not avail Home Loan Protection Plan, then Home Loan will be rejected. Each of the home loan myths is unique in nature. To demystify this myth, the front end staff of bank or HFC has NO ROLE in the home loan approval process. There is a separate team in the bank for risk assessment/home loan approval. The front end staff only threaten a borrower to complete their insurance targets. Bundling of Financial Products is ILLEGAL, and you can complain to concerned authorities. 4. Longer Home Loan Tenure is Good because of Lower EMI: It is one of the home loan myths with significant financial impact on the borrower. Usually, it is in the interest of the bank to pitch long tenure home loan. It means more interest income for the bank. The sales pitch of a bank in such cases is that borrower will pay lower EMI. The borrower fails to understand the trap behind the same. Higher interest outflow means a substantial increase in the cost of acquisition of the property. Until unless it is necessary, you should keep EMI as high as possible and home loan tenure as short as possible. 5. HDFC Home Loan is from HDFC Bank, and LICHFL Home Loan is from LIC India: This is one of the home loan myths that favours particular HFC’s. LICHFL is a listed company that is only promoted by LIC India. It is not a Govt Housing Finance Company against popular perception. As shared by some of the readers, the sales team of LICHFL pitch home loan from LICHFL as a loan from Govt backed LIC India. Similarly, HDFC Ltd is a sister concern of HDFC Bank & has NO direct relation to HDFC Bank. 6. Avail Home Loan for Tax Deductions: Home Loan Tax deductions is one of the main attraction to avail Home Loan. In many cases, a buyer is forced to avail Home Loan though he/she was not in a need of same. 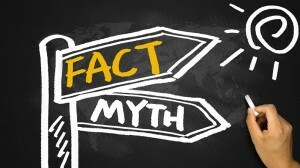 It is one of the home loan myths based on mis-selling and inaccurate representation of the facts. Though i am not saying that this fact is 100% wrong. In some of the cases wherein husband and wife avail joint home loan for the joint property. In such cases, if both the spouses are in highest tax bracket then it might be financially beneficial to avail Home Loan. It is very subjective and depend on a case to case basis. 7. High CIBIL Score means guaranteed Home Loan approval: I resist including reference of CIBIL score in my posts, but it is so critical that i can’t avoid :). Recently one of my readers wrote to me that his Home Loan is rejected despite a CIBIL score of 808. As i keep highlighting that Home Loan cannot be taken for guaranteed. Even in the case of high CIBIL score. CIBIL score is dependent on multiple factors. One of the main reason is a mismatch in income and CIBIL Score. I shared this in my post on Home Loan Rejection. I can share more home loan myths but tried to cover all the imp ones in this post. Home Loan is a long-term commitment, and a borrower should commit only after due diligence. In any financial transaction, you cannot avoid 100% risk. An informed and intelligent decision making mitigate the risk to a large extent.